Maryland’s Cecil College opened its new three-story, 28,683 -square-foot, engineering and mathematics (E&M) facility with the start of the 2014-15 academic year. Designed by Marshall Craft Associates, the $19.7 million building is pursuing LEED® Silver certification, the first in Cecil County. 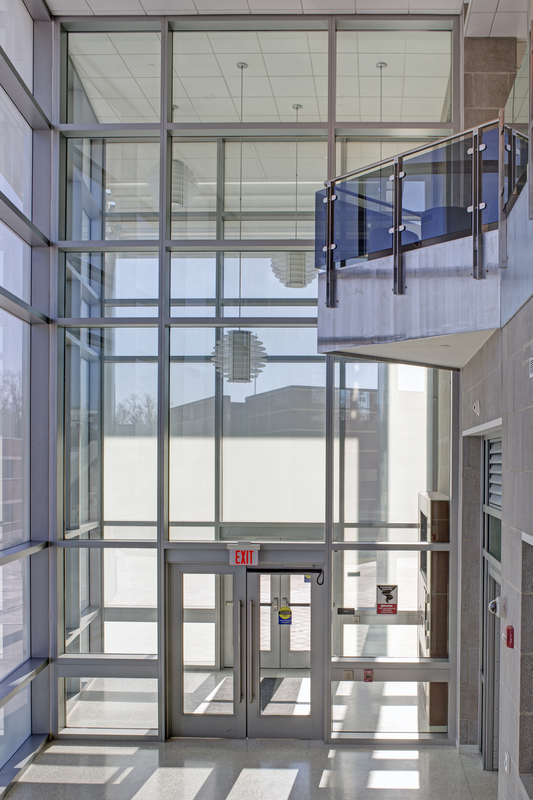 Supporting the project’s aesthetic, environmental and other performance goals, Wausau Window and Wall Systems contributed the curtainwall and sun shades, Tubelite Inc. supplied the entrance systems, and Linetec provided the finishing. Approved as part of the 10-year Campus Master Plan launched in 2009, the new E&M building features eight learning laboratories, two laboratory preparation rooms for engineering and physics, a math tutoring and test center, distance learning rooms and study areas. While these new resources will support Cecil College’s rapidly growing degree programs, it also assists the college in preparing students for careers in science, technology, engineering and mathematics (STEM). The building was designed to promote a high sense of connection to the outdoors from within and to heighten a sense of transparency from the outside. “To create this image, while remaining energy efficient and sustainable, required careful attention to strategies for controlling sunlight cascading onto the building façade, while protecting outside views from the interior,” said Rick Barton, architect and project manager for Marshall Craft Associates. Working closely with the architects and construction manager Riparius Construction, Inc., Chesapeake Glazing, Inc. (CGI) installed approximately 12,800 square feet of Wausau’s SuperWall™ curtainwall and 168 linear feet of ClearStory™ sun shades. For 30 years, glazing contractors have relied on SuperWall for projects requiring quick installation, easy assembly and a test-verified performance. 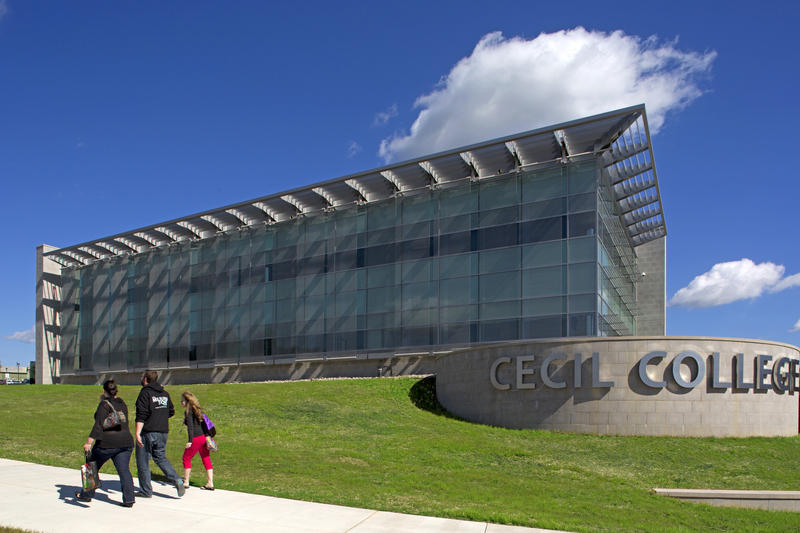 For Cecil College’s E&M building, SuperWall contributes to the facility’s overall energy efficiency. It can achieve NFRC U-factors as low as 0.35 BTU/hr-sqft-ºF with Frame Condensation Resistance Factor (CRFf) of 69 and higher. 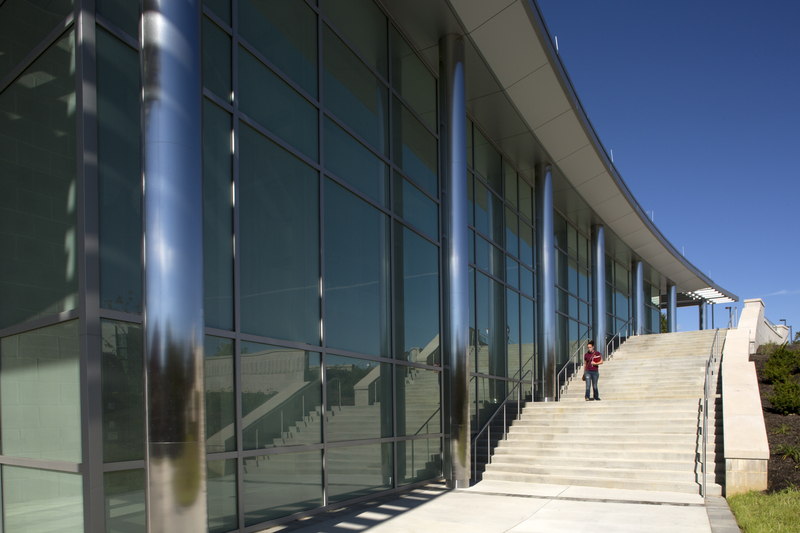 Curtainwall systems with high thermal performance and condensation resistance help reduce the HVAC peak loads and associated energy costs. This in turn improves the building’s overall carbon footprint, while maintaining the outdoor connection and large daylight openings. 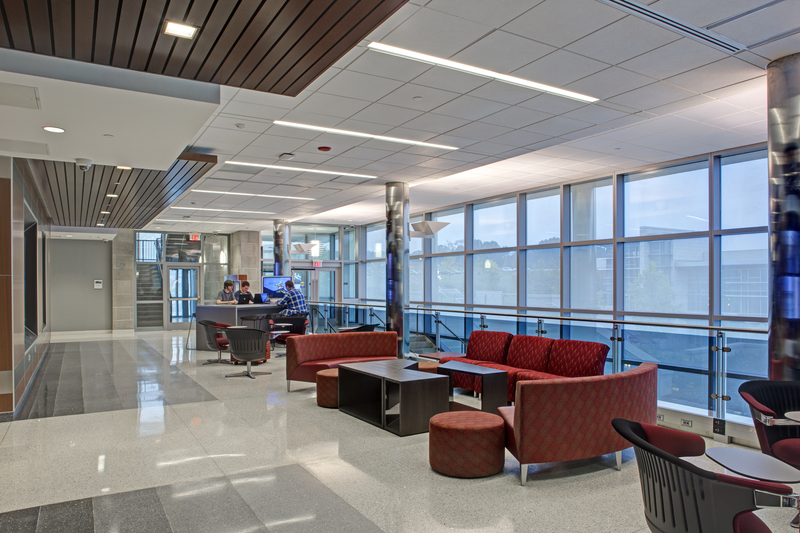 Natural light is maximized throughout the building and controlled through a central system including daylighting controls, which reduce artificial light levels when available natural light provides sufficient illumination. Supporting these objectives, Wausau’s sun shades’ 2-inch-deep, round blades provide shading from direct sunlight, glare protection and daylight redirection. Tubelite Inc. outfitted the E&M building with seven pairs of 6-by-7-foot double doors and two 3-by-7-foot single doors. Linetec finished the aluminum doors, curtainwall framing and sun shades using a two-coat, 70 percent polyvinylidene fluoride (PVDF) resin-based mica coating. The Silver color was custom-blended in Linetec’s in-house laboratory. As an environmentally responsible finisher, Linetec captures the liquid paints’ volatile organic compounds (VOCs) to eliminate the exhaust of potential pollutants. Tested to meet the American Architectural Manufacturers Association (AAMA) 2605 stringent specifications, the resulting, durable coating ensures a long-lasting finish. Cecil College’s president Dr. W. Stephen Pannill, stated, “This building is out front and creates a bold sense of arrival, a place of importance in Cecil County. In October 2014, the building was dedicated to the late Sandy Fabella, one of the college’s first full-time professors who shaped its math and physics department. Wausau and its staff are members of the American Architectural Manufacturers Association (AAMA), the American Institute of Architects (AIA), the APPA – Leadership in Educational Facilities, the Construction Specifications Institute (CSI), Design-Build Institute of America (DBIA), Glass Association of North America (GANA), the National Fenestration Ratings Council (NFRC) and the U.S. Green Building Council (USGBC).